The Dakota Gas Chem Lab team and students used dry ice to blow up a balloon, turn a syringe into a rocket, and make ghost bubbles. 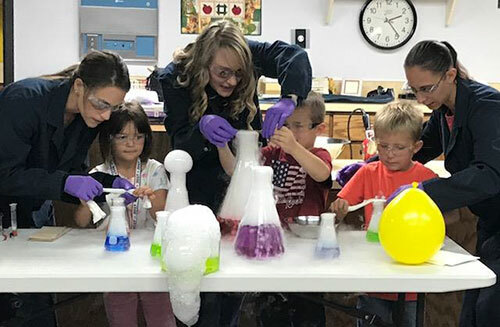 Dakota Gas‘ Great Plains Synfuels Plant chemistry laboratory employees recently spent time in the Beulah (ND) Elementary kindergarten classrooms sharing their love of science and experiments with the students. 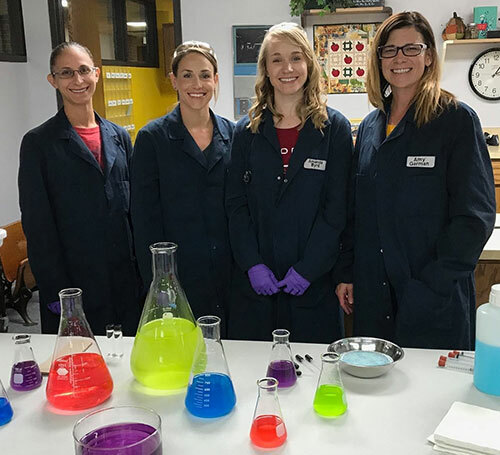 “We were invited to visit the kindergarten classrooms to do a few science demonstrations, but also talk about our careers as chemists,” Synfuels Plant Laboratory Superintendent Amy Garman says. Garman and fellow chemistry lab employees Michaela Eisenbeisz, Nicole Coleman, and Amanda Byrd, gave two presentations to about 56 students. The PRIDE safety group provided safety glasses for the students to use during the demonstrations. The group presented a bit of Synfuels Plant history, as well as what is made from coal at the plant. They also shared information on how the chemistry lab fits into the whole process. “The students were interested in all the products that can come from coal,” Garman says. (left to right): Michaela Eisenbeisz, Nicole Coleman, Amanda Byrd, and Amy Garman. The rest of the presentation focused on gas – methane, hydrogen, helium, krypton/xenon, oxygen, carbon dioxide, and nitrogen – all produced at the plant except for helium. In another demonstration, dry ice (CO2) was used to blow up a balloon, turn a syringe into a rocket, and make ghost bubbles. Liquid nitrogen was used to make ice cream, create special dragon cheese balls, and freeze different items. Word of the group’s great presentation made it to neighboring Hazen, ND, first graders, who invited the group to give the same presentation at the end of the month.